In the twenty-first century, mission as healing and reconciliation is has become for many the preeminent paradigm of mission. On this page you will find details of work being done on this theme in connection with Edinburgh 2010. 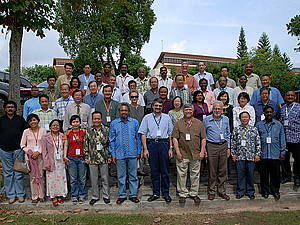 The Edinburgh 2010 study process for ASEAN and Sri Lanka held its conference at STM in Malaysia on 8-11 June 2009. Delegates from Indonesia, Malaysia, Myanmar, Philippines, Singapore and Sri Lanka were joined by friends from Germany, New Zealand, the USA and the UK. The theme of the event was 'Mission as reconciliation in pluralistic contexts'. The conference concluded, 'Reconciliation is possible because of what God has done through Christ. The reality of his presence has been experienced in the here and now in the midst of conflict situations', and prayed to see that 'the whole church brings the whole Gospel for the whole person to the whole world in holistic ways with holistic motives' so that God’s reign of peace, love, justice, light and joy will come upon the earth', believing that 'Christ will bring the final fulfillment of his promise of the reconciliation of all creation when he comes again in glory!'. Download papers and a conference statement (pdf file) here. With the vision of “Transforming society by creating healing communities within Missio Dei” this group reflects on the holistic and integrated nature of Christian mission and healing and demonstrates ways in which Christian communities can contribute towards healing and reconciliation in contemporary contexts. As a contribution to transversal theme 3 - Healing & Reconciliation – of Edinburgh 2010 they have compiled a publication on mission and healing. This publication comprises two parts: Part 1 is a summary of the most valuable ecumenical documents on health, healing and wholeness which have been approved by WCC after the 1960s. Part 2 presents best practice examples of healing communities from all continents. The book is the result of the work of the group in the years 2008 and 2009. The examples in part 2 were all provided by the group members who also worked together and agreed on the content of part 1. The booklet was prepared for publication by Dr Beate Jakob at the German Institute for Medical Mission (DIFAEM), Tübingen, Germany, in coordination with Dr Gisela Schneider, DIFAEM, Dr Manoj Kurian, WCC and Rev. Jacques Matthey, WCC. The booklet is available for download (pdf file) here. Many countries of the global South are seeing growth among Christian groups and churches where healing is seen as a usual part of congregational life. Furthermore, in the medical sector, epidemiological studies – particularly in the USA – are providing real scientific confirmation of a positive link between spirituality and physical and mental wellbeing. So it is time for us in the congregations, and in the social and community organizations of the Christian churches in Germany to take a measured and critical look at the issues of health, spirituality and healing, and to seek practical ways forwards. Download the Difaem position paper on 'Health, healing and spirituality' (pdf file) here. In 2005, the Commission on World Mission and Evangelism of the World Council of Churches received a document on 'Mission as ministry of reconciliation', which formed one of the preparatory documents for the WCC conference on World Mission and Evangelism in Athens that year. 'Mission as ministry of reconciliation' saw reconciliation particularly as the ministry of the Holy Spirit and the conference took the theme, 'Come, Holy Spirit, Heal and Reconcile'. The website of the conference is at www.mission2005.org. Read 'Mission as reconciliation' online here. In 2006 York St John University, UK hosted the inaugural International Conference on Peace and Reconciliation. The event was sponsored by Youngnak Presbyterian Church, Seoul and over 150 people from 16 different countries attended the conference. The keynote addresses from this conference have been published as Peace and Reconciliation: In Search of Shared Identity (Ashgate, 2008). Download information about the book (pdf file) here. The handbook for the conference, which includes abstracts of the papers presented, can be downloaded (pdf file) here. The third conference is planned to be held in Seoul, South Korea in November 2010. Further information will be released shortly on the York St John University website.